Afraid to grow orchids? 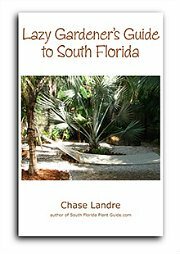 Try landscaping with easy care ground orchids - colorful and unusual plants for South Florida gardens. These plants have a different look than the typical (though very beautiful) epiphytes. But they blossom more often and have less of a learning-curve challenge, especially when planted in the right spot. Some people say growing orchids is easy. Others say it's hard to do. Terrestrial orchids may have complicated names but their care is anything but. Plus they're generally less expensive to buy, though they may have to be special ordered at your local nursery. 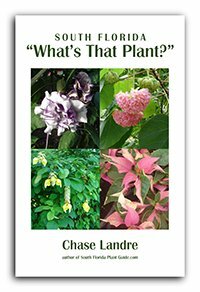 On this page we feature two types of these plants - one for shade, one for sun - each with a unique look and both are simple to care for. Spathoglottis plicata is a shade loving plant sometmes known as "Philippine Ground Orchid." Some sources say it takes full sun, but in South Florida part shade to full shade (with bright indirect light) is best. This plant grows about a foot tall and spreads slowly. It has the look of a wildflower with blooms in purple, peach, yellow or multi-colored. The small and pretty blossoms appear during warm months of the year. The arched leaves have the pleated look of baby palm fronds. Landscape uses: These ground orchids are very effective in the landscape when massed as a groundcover under trees. They also work in the front of the border, along a walk or around the base of a small palm. The ideal light is partial sun to produce plenty of flowers. Too much sun (or cold weather) can turn the leaves bronze in color - not unattractive but it indicates the plant isn't happy. Too much shade and you'll get no flowers. The east side of the house or a spot with shade midday through mid-afternoon works well. The plant will spread out and its foliage will show white roots trailing from the stems...this can give the plant a somewhat wild look, so it's better when used in an informal landscape. 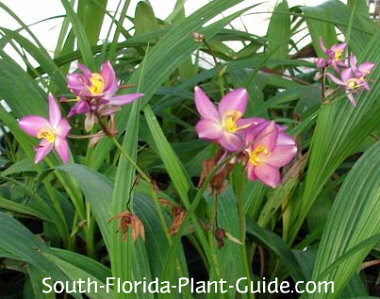 These ground orchids are moderate growers that grow about 2-1/2 to 3 feet tall and wide. 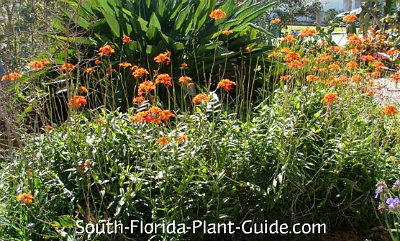 Landscape uses: This plant functions as an accent (especially nice for color near the entry), or it can be used to line a walk, grow along a porch or deck, or surround a palm or other specimen. Both of these plants need the warmth of Zone 10 to flourish. In Zone 9B they can be container grown and moved indoors during cold weather. Amend the soil with top soil (or organic peat humus) for dry sandy areas. Give these orchids a well-drained location. Water on a regular basis but don't keep the area overly wet. Spathoglottis may need to have browned leaves trimmed off now and then. 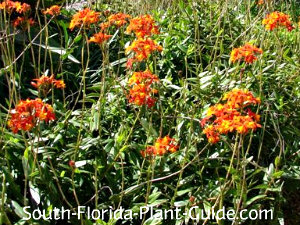 Epidendrum's flower stalks should be cut back to the ground once they're done. Fertilize during early spring and late summer with controlled release fertilizer. You can supplement feedings with liquid fertilizer. The smaller shade orchid can be planted 12 to 15 inches apart. Come in from walks about a foot. To fill in a naturalized setting, place them in a random pattern rather than in straight rows. The larger one should be placed about 2-1/2 to 3 feet from the nearest plant. Come in from walks and drives 3 feet, and out from the house about 2 feet. These plants will grow in containers. Spathoglottis - alocasia, ferns, dwarf tibouchina, cordyline, pentas and variegated arboricola. Epidendrum - Hope philodendron, thunbergia, firespike, blue daze, and croton. 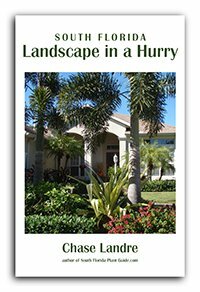 Learn how to get instant curb appeal with fast growing plants and landscaping techniques!